Nick Dellonte performs an exercise as part of his vision therapy STARTING IN THE FIRST GRADE, Nick Dellonte’s teachers would tell his parents that he was fidgety and wiggly at school, largely because he had trouble focusing and being attentive. “At first, we didn’t question what the teachers were telling us about his behavior,” says his mother, Amy Barry, 47, a housing financing specialist who lives in Bethesda. But when Barry saw how much Nick was still struggling with reading in fourth grade—suffering from headaches whenever he picked up a book—she took him for a complete eye evaluation by an optometrist. “His eyeballs were competing with each other to send the image back to the brain—the result for Nick was the words looked like they were dancing on the page” Barry says. Convergence insufficiency (CI) is a common vision disorder that often affects children and can lead to double or blurry vision, headaches while reading, concentration problems and eyestrain. It stems from an eye-muscle coordination problem, which means it can’t always be corrected with glasses, according to the National Eye Institute, part of the National Institutes of Health (NIH) in Bethesda. Glasses, contact lenses or corrective surgery are common solutions to vision problems, but they aren’t always the only—or best—solution, according to ophthalmologists and other vision experts. A lesser-known option for some of these disorders is vision therapy, which is basically physical therapy for the eyes. That’s a distinction not everyone understands, explains Dr. Stan Appelbaum, Bryce’s father and the founder and president of the practice. “There’s no such thing as 20/20 vision—it’s 20/20 eyesight” Stan Appelbaum says. While eyesight refers to the eyes’ ability to distinguish small details—to see letters on a chart or signs on a street, for example—“vision goes beyond that” says Stan Appelbaum, who also suffered from vision problems and credits vision therapy with helping him become a voracious reader. 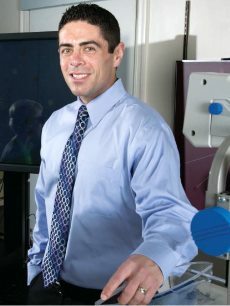 Vision therapy has been proven to help alleviate a range of disorders, including lazy eye (amblyopia), eyes that aren’t properly aligned with each other (strabismus), double vision (diplopia) and convergence insufficiency, and even some visually-based reading and learning disabilities, Bryce Appelbaum says. “Many kids with convergence insufficiency go untreated for years because they thought it was a reading problem or laziness” says Dr. Vike Vicente, a pediatric ophthalmologist in Chevy Chase. Vision problems such as convergence insufficiency sometimes can go hand in hand with attention deficit disorder or attention deficit hyperactivity disorder and exacerbate the inattentiveness that results from those conditions. “Vision therapy doesn’t cure ADHD, but it can get rid of the visual attention problem that often goes with it—and sometimes that’s enough, particularly if we catch it early,” says Stan Appelbaum, author of Eye Power: An Updated Report on Vision Therapy (BookSurge Publishing, 2009). “Convergence insufficiency is very frustrating for patients, parents and teachers because it affects near tasks such as reading, writing or even hand-held video games,” Vicente adds. In a 2008 study involving 221 children with CI, researchers at NIH found that office-based vision therapy, when combined with at-home reinforcement, is “more effective” than home-based therapy alone in treating convergence insufficiency. An intense program of vision therapy involving four to six sessions per week for 10 months helped Nick Dellonte improve his reading skills to above grade level. Now 11, Nick genuinely enjoys reading and has become an exceptional athlete who can score from well beyond the 3-point line during basketball games, Barry says. Despite proven benefits, vision therapy remains an unknown to many people and practitioners. After a particular vision problem is diagnosed by an ophthalmologist or optometrist, vision therapy typically involves an individualized treatment program designed to enhance “the brain’s ability to control the eyes and get the mind, eyes and body to work together,” according to Bryce Appelbaum. Through a series of in-office and at-home exercises, people learn to retrain their eyes to function more efficiently when it comes to focusing, tracking, eye teaming, eye movement control and visual processing. Treatment typically involves one or two hour-long sessions per week over the course of four to 12 months. Costs can run from $125 to $200 per session, depending on the practice and the length of the session. Some medical insurance policies will cover treatment. The therapy often involves the use of computerized programs. Filters, lenses and prisms are incorporated to control how the eyes see various targets one at a time. Patients perform basic activities such as shifting their focus from the center of a target to a point in the distance or visually tracking beads on a stationary circle. A more complicated exercise could include inserting pegs into various holes in a particular pattern on a rotating pegboard while standing on a balance board. In addition to treating functional visual problems, vision therapy can help with headaches caused by convergence insufficiency. It also can be used to treat vertigo and dizziness resulting from problems with the sensory system that “tells us which way is up and which way is down” Stan Appelbaum says. Certain vision problems, such as convergence insufficiency or double vision, can occur after a concussion or other head trauma. A 2012 study by researchers at the New Jersey Institute of Technology involving 557 people with traumatic brain injuries found that 23 percent had developed CI. For these types of brain injuries, a multidisciplinary approach to rehabilitation—including vision therapy, occupational therapy and physical therapy—is often warranted, Zeller Manley says. Even an ordinary fall can lead to problems with convergence insufficiency. Bryce Appelbaum recently worked with a 48-year-old Bethesda woman who suffered a concussion after hitting her head on the granite countertop in her kitchen. “As a result of the head injury, she suffered from headaches, double vision, dizziness, eyestrain and an overall sense of fogginess for several weeks before I evaluated her” Appelbaum recalls. Using vision therapy exercises, Appelbaum and the woman worked on her tracking skills and ability to control her eye movements, and she enhanced her depth perception and spatial awareness. After a few weeks of therapy, her symptoms began to improve. She regained her ability to use a computer without discomfort, and her reading comprehension and concentration capabilities were restored to where they were before her head injury. A 2013 study by researchers at the University of Waterloo in the Canadian province of Ontario found that the prevalence of binocular vision disorders such as CI increased from about 41 percent among adults in their 60s to 51 percent among those in their 80s. These disorders often can be improved with vision therapy, Zeller Manley says. “Not everybody benefits from vision therapy—that’s why thorough testing needs to be done” Bryce Appelbaum says. But when it’s done correctly and for the right reasons, many people experience significant progress in a matter of weeks or months, he says. Vision therapy has been the solution to problems that a Gaithersburg woman and her two children had been experiencing. All three had nearly perfect eyesight, but each struggled with having their eyes work together smoothly. “As a child, I had learning disabilities, and because my eyes weren’t tracking properly, I had a really hard time reading,” says Stephanie, now 44, who asked to be identified by her first name only. Her father, who suffered from frequent headaches and eyestrain, was diagnosed with a similar visual tracking problem after she was treated as a child. Stephanie’s children also suffer from similar issues. Her 7-year-old son has had trouble learning to read and playing sports because of vision disturbances. Vision problems affected her 9-year-old daughter’s spatial awareness, so she frequently injured herself by falling off the chair she was sitting on or walking into things. “When she’d read, she would put one cheek on the table so that one eye would do the bulk of the work,” Stephanie recalls. After two years of twice-weekly vision therapy sessions, Stephanie’s daughter has become an advanced reader for her age and grade and now plays basketball and baseball. Her son continues to get vision therapy. “The difference in my daughter has been profound. It’s a total success story” Stephanie says. Stacey Colino lives in Chevy Chase and regularly writes about health, psychology and family issues for national magazines. 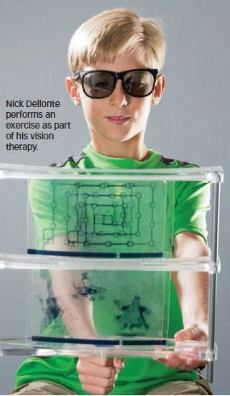 Share the post "Seeing Success: Vision Therapy is Helping Patients Get Their Eyes Back on Track"